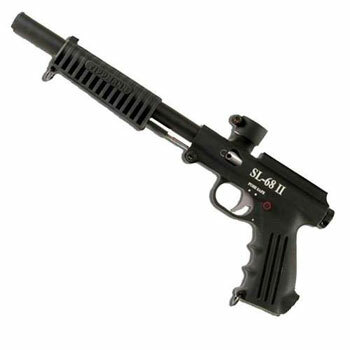 The SL-68II from Tippmann has been redesigned and improved, making it a perfect addition to your pump arsenal. Aside from all of the standard features of a Tippmann gun (solid cast aluminum, non corrosive internals, metal trigger etc. ), the SL-68II is equiped with a redesigned feedneck that fits most standard hoppers as well as a redesigned ergonomic grip for comfort and control. Features Breech lock anti double pump feature 11″ performance barrel for accuracy Ribbed front grip for added control External velocity adjuster Breech port for easy cleaning Solid cast aluminum for durability Built-in sight rail Integrated tank adapter with built-in gas line Metal trigger for stability, auto trigger for faster firing Front and rear sling mounts Non corrosive internals Click Here. This is a nice gun, I use it for my tournaments. I actually have one up for sell in my blog!